05 Apr 2015 / 21:00 H.
DHAKA: Bangladesh opposition leader Khaleda Zia left her office Sunday for the first time in three months in a sign of easing tensions after deadly protests had plunged the country into a political crisis. Zia, 69, was taken by car to a court where she surrendered and secured bail in two graft cases against her. Security was tight with hundreds of police and border guards surrounding the court. Authorities had confined her inside her office compound in an upscale district of Dhaka on January 3, after she threatened to lead a massive anti-government rally through the capital on the first anniversary of a disputed national election. A judge issued an arrest warrant against the former prime minister in late February after she repeatedly failed to attend hearings in the graft cases. 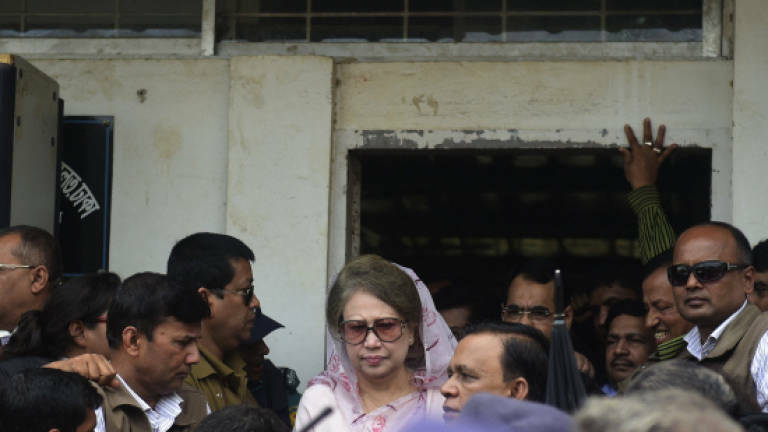 "She left the office at 9.55am (0355 GMT)," Shamsuddin Dider, a spokesman for Zia's Bangladesh Nationalist Party (BNP), told AFP, adding she was granted bail in both graft cases. "It's the first time in more than three months she has stepped out of her office, where she was confined on the night of Jan 3," he added. Zia had threatened to lead the rally in the capital on the first anniversary of the general election on Jan 5, 2014. The BNP and a 20-party opposition alliance which she leads had boycotted the election because it was not held under a neutral caretaker administration, as in the past. Police padlocked her office's front gate, used pepper spray on her as she tried to leave the compound, and parked ten trucks loaded with sand and bricks outside the gate to block the exit. Security was relaxed weeks later and authorities said she was free to leave – although the BNP said she was still confined to her office. Restrictions on entering the office compound remained. More than a dozen people were arrested as they tried to meet Zia or bring in food for her. While confined to her office, a defiant Zia urged supporters to enforce a nationwide transport blockade. The blockade unleashed deadly violence, leaving more than 120 people dead as opposition activists firebombed hundreds of buses and trucks and police responded by firing live rounds. Around 15,000 opposition supporters and dozens of BNP senior officials have been arrested as part of a crackdown by Hasina to end the unrest. But in recent days tensions have eased. Mass arrests have eroded the effectiveness of the transport blockade and the BNP has turned to politics – deciding to take part in mayoral and local council polls in Dhaka and the port city of Chittagong. On Saturday BNP officials broke padlocks and opened the party's main headquarters in central Dhaka after it was sealed off by police at the start of the year. In late February a lower court issued an arrest warrant against Zia for allegedly embezzling US$650,000 from a charity and a trust when she was the premier in 2001-6. The warrant has not been executed. Zia has called the cases politically motivated and aimed at destroying her party. The opposition leader also faces at least four unrelated charges over the ongoing violence.